I may be biased about this film as I was in a production of it 7 years ago where I met my current girlfriend and future wife (sounds familiar after watching this film). But this is the film and I tried my hardest not to compare it to the stage musical. I have to say I was impressed. The script holds up incredibly well. The comedy is all still laughable and not as dated as per usual of films from this era. At times it felt very scripted, but that’s just the style of the time period and the genre. And it’s interesting that the main synopsis of the film is actually the B plot. 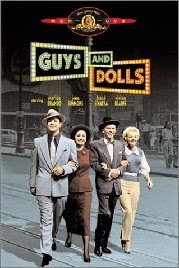 As the movie is really about guys and dolls–as simple as that sounds–it’s ingeniously disguised as a film showing a glimpse of the world of underground gambling. And the music goes beautifully with what the main themes of the story are. Even one of the gambling songs (Luck Be A Lady) begs for monogamy from a supernatural force. The performances of all four lead were great too! Although I’m pretty sure I caught Frankie acting on a couple lines. But I’ll let it slide since he was very convincing otherwise. And the characters may not have been as deep as can be, but they were very well defined–which is the least you can expect from a musical comedy. The only thing that I would do differently would be for Sky Masterson and Sarah Brown to not get married at the end with Nathan and Adelaide. It takes away from their moment a little bit, and it doesn’t make much sense why Sarah wouldn’t get married in a church since she is a holy roller after all. They should have showed them getting engaged or something like that instead. Overall, Guys and Dolls is silly and fun and a quick two and a half hours of your time! I definitely recommend a watch!